The source and terminus of the Nile River are contained inside quadrants of the 1/10th scale model great circles of the earth and the moon, the earth model like the moon model is based on regional geographic features and is aligned to several interacting geometric designs that are the subject of this and following pages. 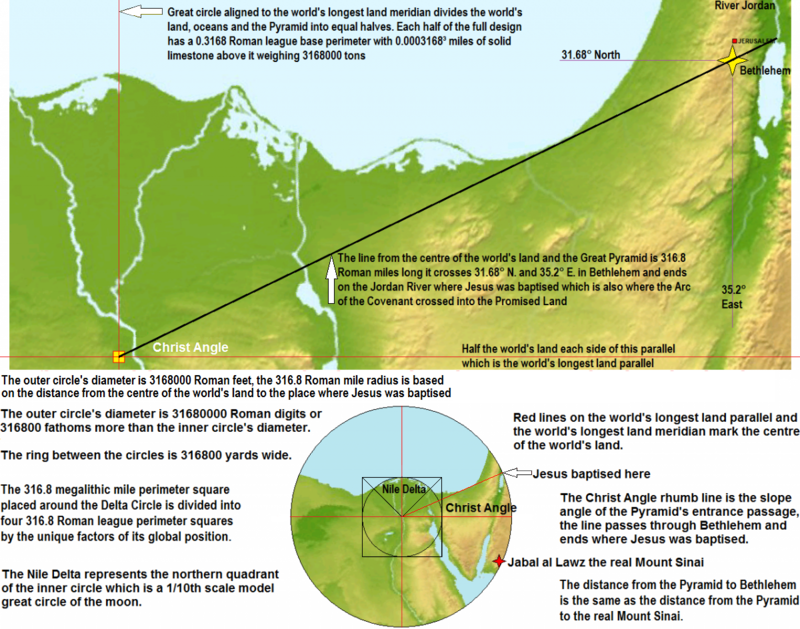 The Great Pyramid occupies the centre of the model great circle of the moon and is built on the pivot point of the Nile Delta quadrant which is the delta’s geographic and geometric centre. This is one of the few places on the earth’s surface that can support the Pyramid’s great weight; this is also the centre of the world’s land where the world’s longest land meridian crosses the world’s longest land parallel. This is where the world’s longest river leaves the world’s biggest desert and enters the world’s most fertile land the Nile Delta which fills and defines the northern quadrant of the 1/10th scale model great circle of the moon, this has been featured in many books and magazines. 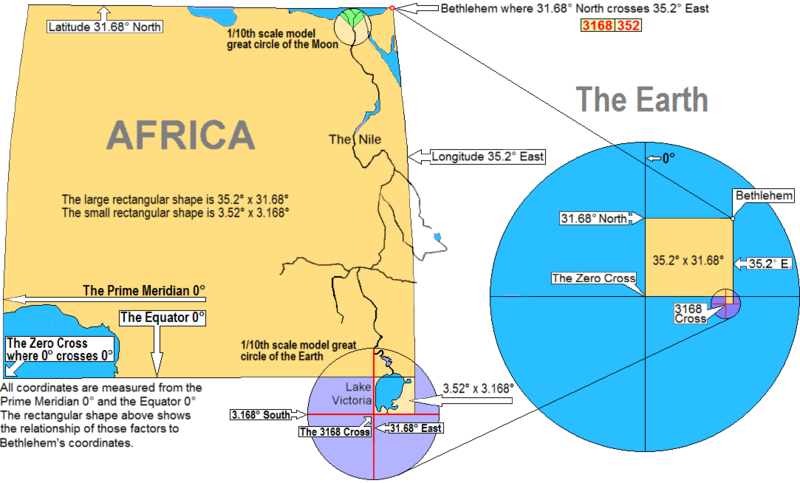 Now the perfect partner for the moon model is revealed at the other extremity of the Nile which is the 1/10th scale model great circle of the earth that encloses Lake Victoria the source of the Nile in its north east quadrant. The 3168 Cross is the governor and interpreter of the region’s geometric geographic designs, the 3168 Cross supplies the exact orientation and measurements needed to interpret the geographic design, potential areas of confusion are eliminated or bypassed by calculating how the region’s geometric features relate to the 3168 Cross. The 3168 Cross’ lines reach 3168 furlongs North, South, East and West from where 3.168° south crosses 31.68° east, the Great Rift Valley Crescent starts and ends on 31.68° east and 3.168° south is the crescent’s only line of symmetry. 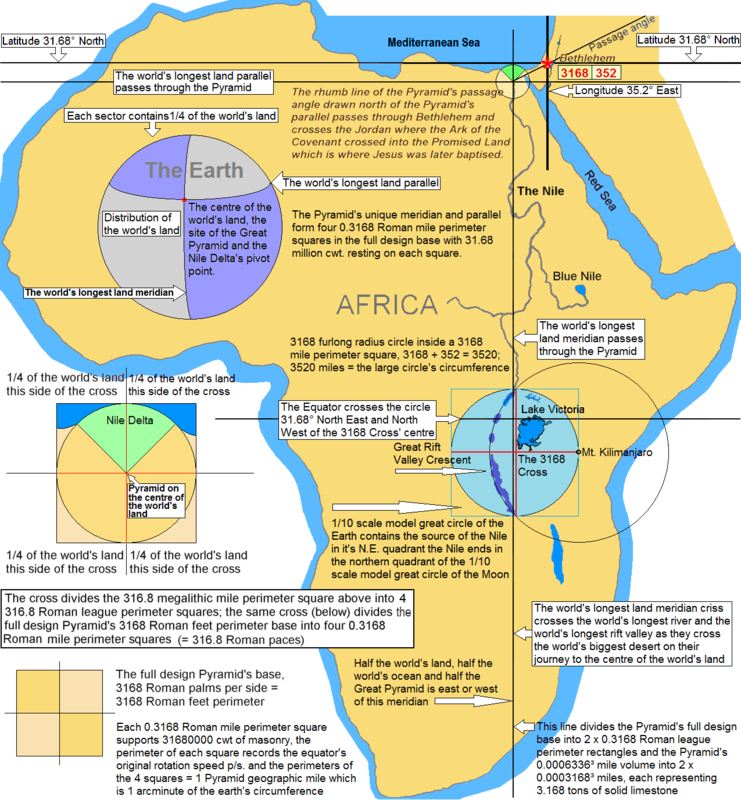 The 1/10 scale model great circle of the earth placed around the 3168 Cross perfectly encloses the Great Rift Valley Crescent and also perfectly encloses the western quadrant of the larger circle which occupies exactly half of the smaller circle’s area. 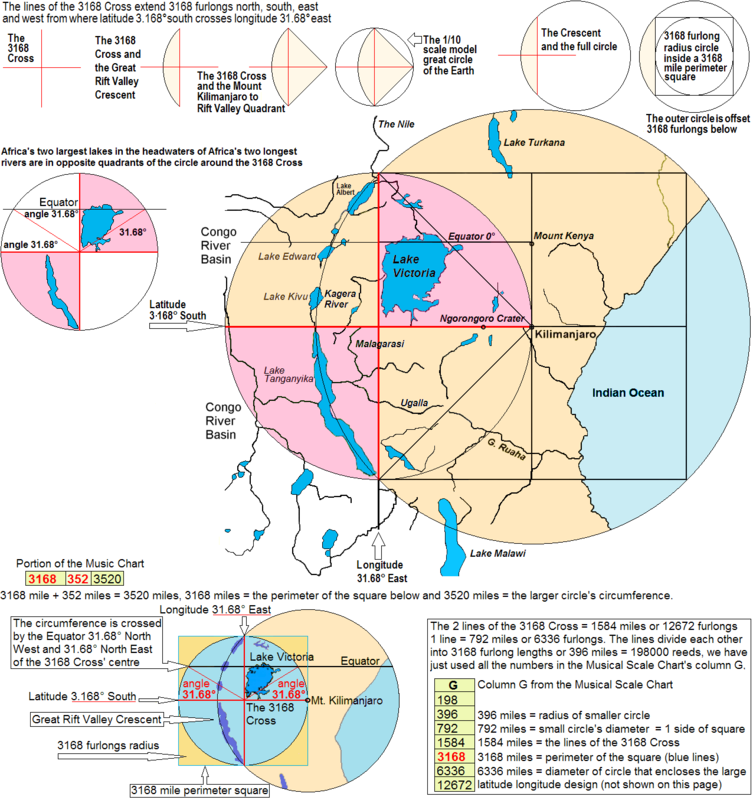 Lake Victoria the source of the Nile is contained in the north east quadrant of the smaller circle therefore the Nile’s extremities are enclosed in 1/10 scale model great circles of the Earth and the Moon and each circle conforms to regional geographic features. The 1/10th scale model of the large latitude//longitude design is formed inside the 1/10th scale model great circle of the earth by the 3168 Cross, the equator and longitude 35.2°. To transform the 1/10th scale model into full scale we first change the coordinates of the 3168 Cross into the coordinates of the Zero Cross, then change the model’s 31680 chain radius to 31680 furlongs radius and change the model’s 0° parallel to latitude 31.68° North this completes the transformation. Bethlehem’s longitude 35.2° East remains unchanged because it is a feature of both designs, this confirms that the model’s prime meridian and prime parallel i.e. the lines of the 3168 Cross really do symbolize the earth’s Prime Parallel and Equator. This is more powerful evidence that the Creator ordained where the Prime Meridian of the latitude longitude system would be located which is also supported by the numbers of the Musical Scale Chart. The yellow square below represents the 3168 Roman feet perimeter full design Pyramid’s base, the red lines of the cross inside the base = 0.3168 Roman miles and form four 0.3168 Roman mile perimeter squares in the base and remember the vertical section is an analogue of a 0.3168 Roman mile circumference circle which is a 1” to 1 Roman league scale model of a great circle of the earth. 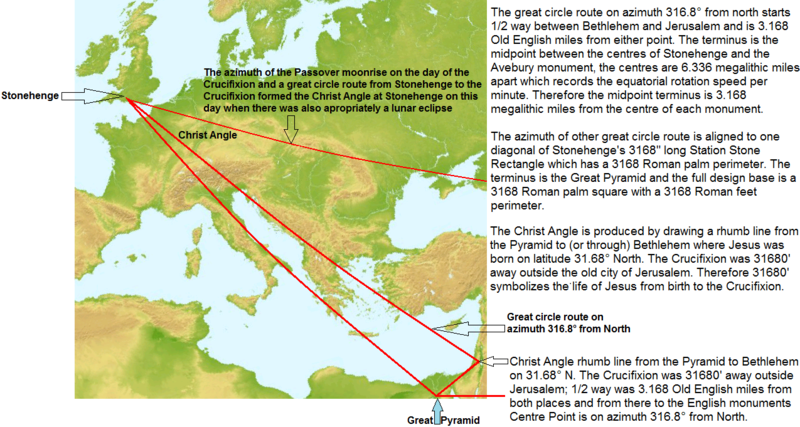 The great circle distance from the Pyramid to where Jesus was baptised is appropriately 316.8 Roman miles (the product of 0.3168 Roman miles x 1000).